Biomass in the Octopus pallidus fishery is indicated by trends in catch per unit effort (CPUE), which decreased from 2005/06 to 2011/12. Since 2011/12, CPUE has fluctuated around 60% of the reference year. Catch is used as a proxy for fishing mortality and in 2015/16 decreased to its lowest level since 2011/12, with similar declines in fishing effort. Historical high levels of fishing effort are likely associated with declines in fishery-wide CPUE but the magnitude of this effect is masked by shifts in spatial fishing effort and the biology of the species. In 2015/16, fishing mortality reduced to within historically sustainable levels where future depletion of the biomass appears unlikely. 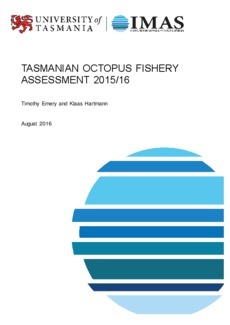 On this basis Octopus pallidus in Tasmania is classified as a sustainable stock.